Left: A man looks over the Potomac River, which was steaming on a 60-degree January day. Right: a stock photo of a child in cold weather. Time to pull out those winter coats! This week’s high of 60 degrees will not be returning any time soon. The warming trend is coming to an end. A cold front, which Storm Team4's Chuck Bell says has dropped temperatures by up to 30 degrees in a single hour, will chill your weekend. Temperatures over the weekend will stay on the cooler side with highs ranging from the upper 20s and 30s. If you're planning to enjoy the warm weather Friday night, prepare for a soaking rain that's set to begin at 5 p.m. The spring-like weather is out and a cold front is moving in on Saturday. News4's Jackie Bensen reports. Overnight Friday and into Saturday, Storm Team4 says you will continue to see overcast skies and rain before temperatures drop. You’ll likely wake up to slippery sidewalks and roads. Those living farther north and west of D.C. may see slight snow showers before sunrise. Saturday will be mostly cloudy due to isolated showers with temperatures moving into the 40s during the afternoon. Temperatures will cool during the night and drop to near-freezing. Sunday will mostly be sunny with temperatures moving into the mid- and upper-20s. Few areas may see temperatures in the teens. Martin Luther King Jr. Day may not be the ideal holiday as far as temperatures. Monday's expected high is 32 with a low of 17. If you plan to volunteer or participate in events or parades, make sure your bring some scarves and gloves to keep warm. Chances of snow return next Tuesday and Wednesday. 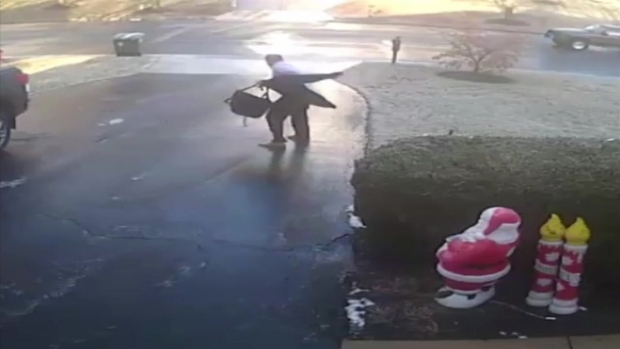 An Ashburn, Virginia man's commute went wrong when he stepped onto his driveway... and took an accidental ice skating trip down his driveway.